I love spending time with my kids in the kitchen. It’s truly the heartbeat of most houses, and ours is no exception. Easy, no bake cheesecake recipes are a great way to mix up a delicious recipe without spending too much time on the recipe. Now that the warmer weather is here, heating up the kitchen isn’t always an option. 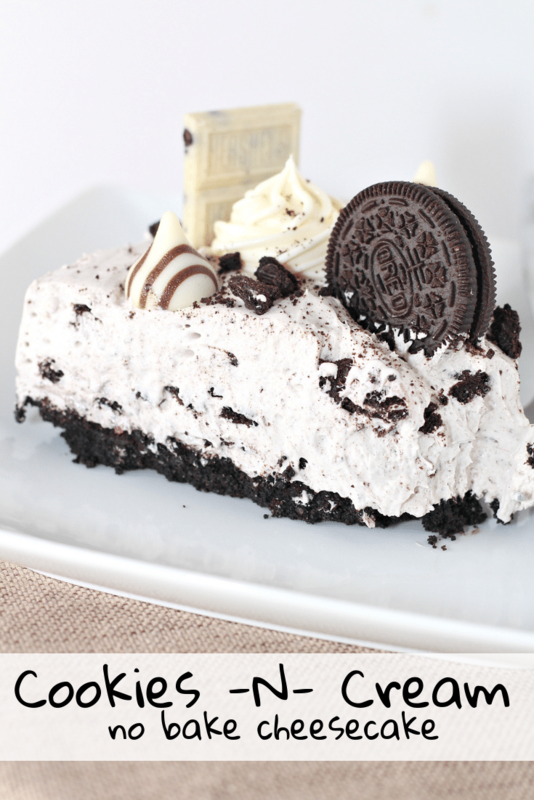 This no bake cookies and cream cheesecake is super easy and can be done in a single afternoon. It’s a perfect classy dessert for any party or gathering. With a light texture and creamy filling, it’s sure to be a crowd pleaser! Of course, keeping the kids from trying to eat all the Oreos is the most difficult part. But, isn’t that part of the fun of childhood? I have to hide Oreos anytime we have them in the house (from Levi AND Josh!). 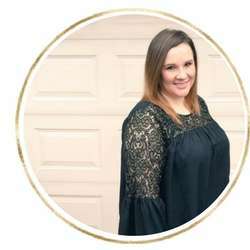 Need other recipes to try with the kids? 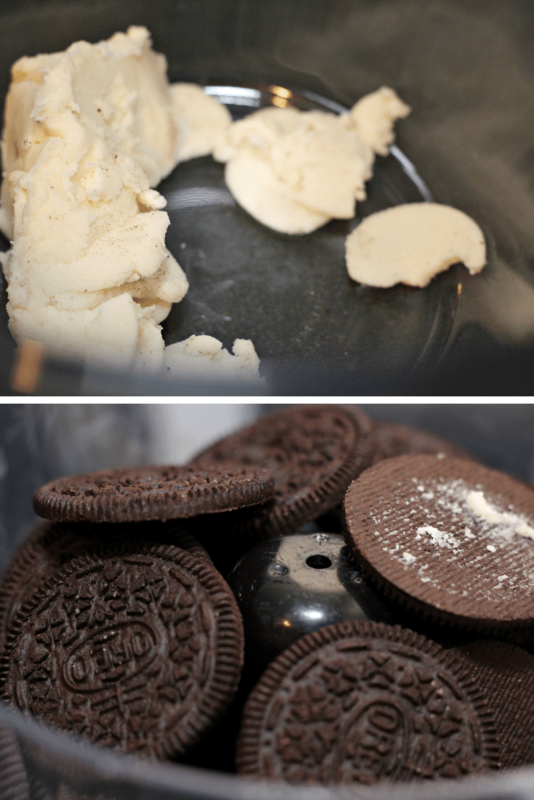 Add cream cheese and sugar with the cookie center and mix until smooth. 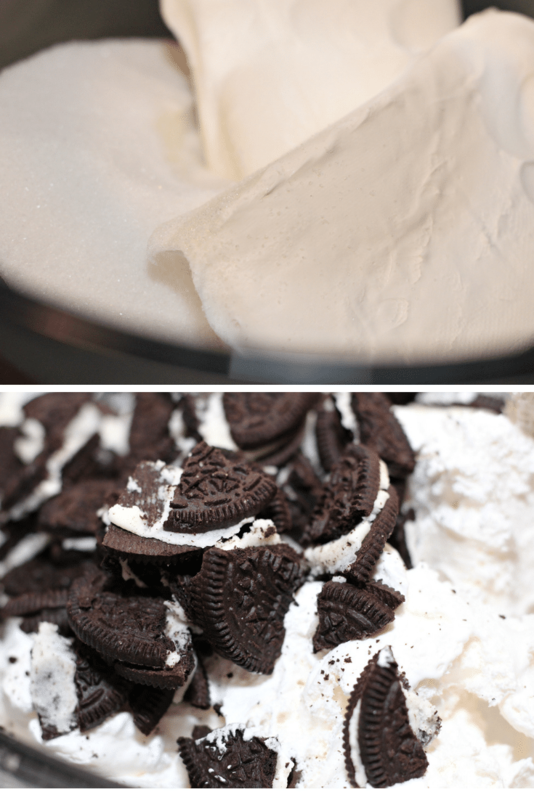 Break up the rest of the Oreos into the mixing bowl, add cool whip and stir to combine. In the food processor, process the cookies until they are a fine texture. Gradually add the butter until it becomes a wet sand consistency. You may NOT need all the butter. Press cookie and butter mixture into bottom of greased cheesecake pan firmly. 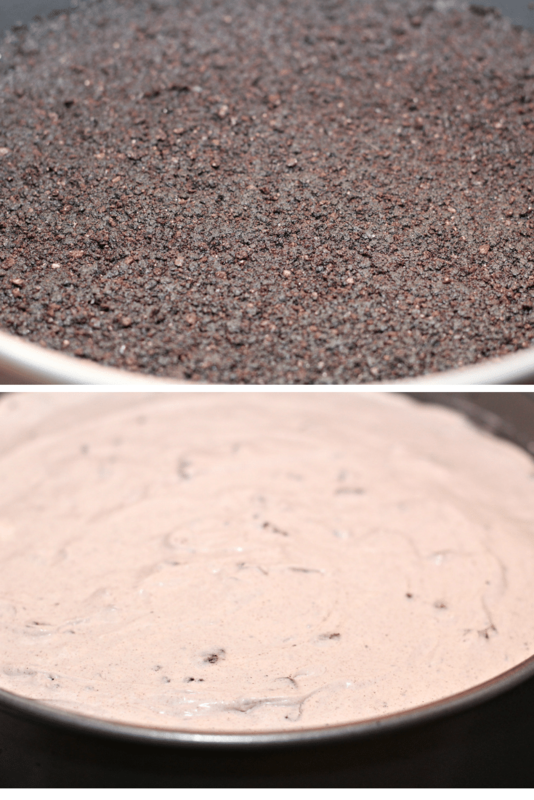 Pour the batter from the mixing bowl over the crust and smooth out. Chill for 3 hours. Top with frosting swirls, kisses, oreos and other candy bar pieces. Freeze for an additional hour after topping. Start by separating a package and a half of Oreos. Placing the centers in a mixing bowl and the cookie into a food processor. Add your cream cheese and sugar into the mixing bowl and mix with a hand mixer until smooth. 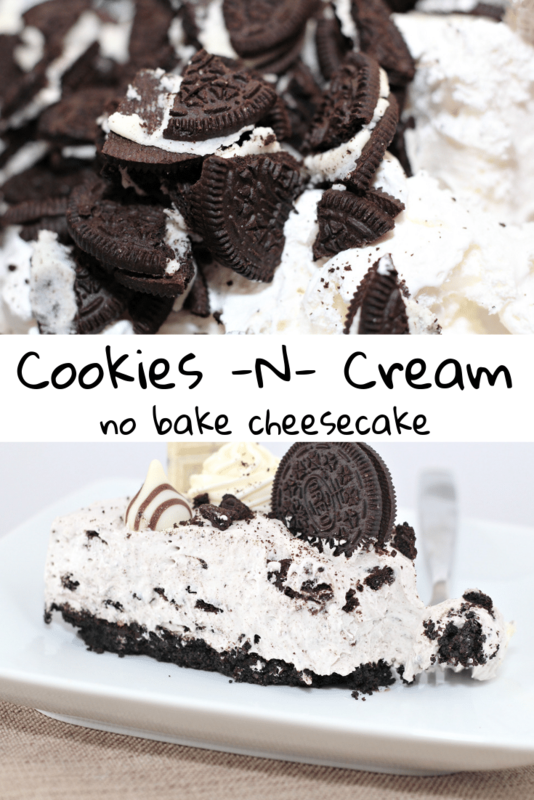 Next add in your cool whip and the rest of your Oreos (broken up). Mix well with a hand mixer until well blended and smooth. Set aside. In a food processor, process cookies until fine. Pour cheesecake batter over curst and smooth out evenly. Once set, add frosting swirls to the top of cheesecake. Then top with oreos, hershey kisses, and hershey candy bars. However you desire. 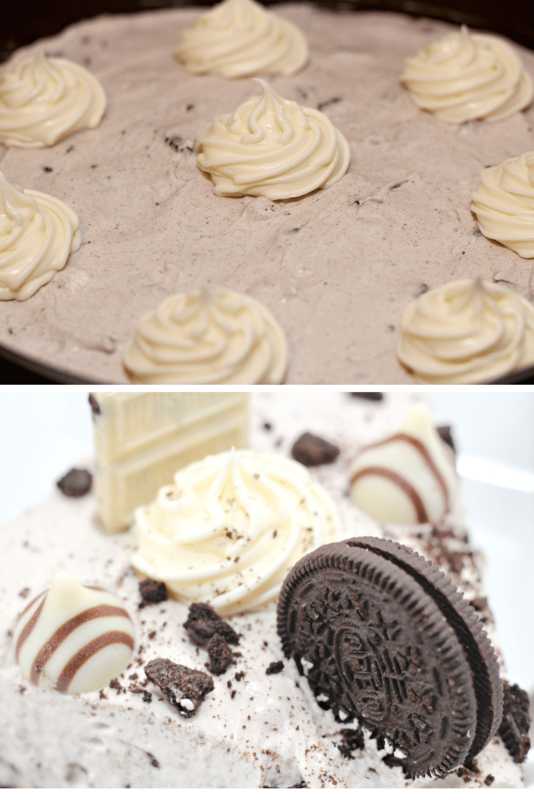 What is your favorite no bake cheesecake flavor? 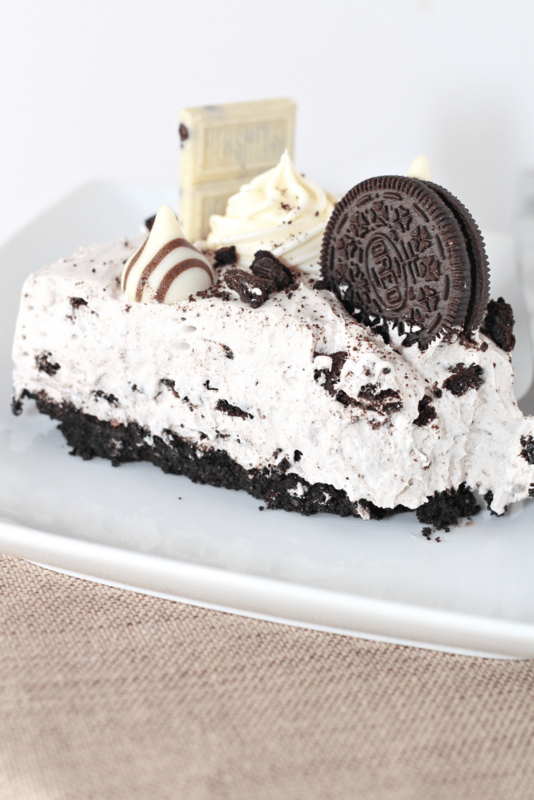 Will you try this cookies and cream cheesecake? Be sure to pin this for later, too! Place in the freezer for one hour. Serve and enjoy!